The bee man’s been (See Can Anyone Hear a Buzzing? May 30). He soon established that it’s definitely honey bees we’ve got here. He had a good look in the attic but there was no hive in there – and he thinks there are probably 2; one on each side of the house, high up between the rafters and the outside walls so we can’t get any access to them. He brought a spare bee suit for Ed (who’s been expressing a lot of interest in said bees) but given no hives were to be found, he sadly never got the chance to put it on. The bee man explained that the swarm we saw was a good sign as bees swarm when they’re moving on with a new queen bee, so the majority of them are now gone (in that hive anyway), leaving an aged queen behind and some loyal hangers on. The only other issue we might encounter is honey dripping through the ceilings – but apparently this is quite rare! So we have bees in the walls of the house and this is where they’ll stay. Mr C tells us that years ago someone used to keep hives up behind the walled garden (which likely explains where the ones in our walls originate from). As Mr C also has a twinkle in his eye at the mention of bees, I’m guessing he and Ed are now hatching a plan…. Categories: castle, country house, countryside, moving, scotland | Tags: bee, honey bee, swarm | Permalink. But then Ed ran through his list with me and now I’ve got list envy…. Categories: acres, castle, country house, countryside, gardens, moving, renovation, scotland | Tags: lists | Permalink. I watched a little girl practice her Highland Dancing on a ferry to Lewis on the West Coast about 8 years ago. I day dreamed then that one day we would live in the countryside in Scotland, that we’d have a little girl and that she’d also learn how to highland dance. Classes in the village start at the age of 3…. Categories: castle, countryside, moving, scotland | Tags: country dancing, highland dancing | Permalink. The good news is that the sun’s been shining for days, Ed’s home for the weekend – and enough of the moss has turned brown to get started (luckily we got the moss killer to lawn ratio right and the grass is still alive). As I’m now proficient on the ride-on lawnmower, I mowed and Ed and Gracie followed behind with the scarifier. By late afternoon the lawn was hidden under a frightening amount of thatch – and as the mower couldn’t cope with hoovering it up we had to resort to hand raking it into lots of separate piles, loading up the mini-trailer and ferrying backwards and forwards to the compost heap. We were out there till late in the evening. Even so, we’re nowhere near done. 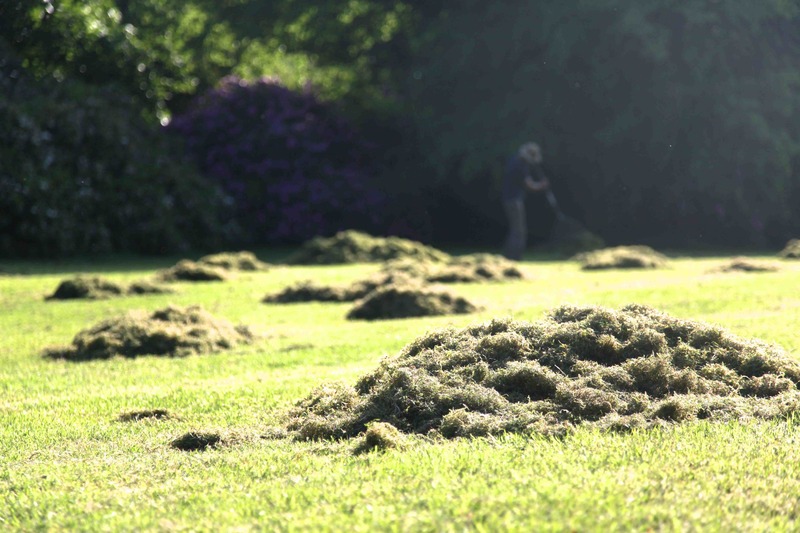 There’s still loads of moss to kill that was missed from last time – and today we only managed a quarter of the lawn. Categories: acres, castle, country house, countryside, gardens, moving, scotland | Tags: lawn, moss, scarify | Permalink. 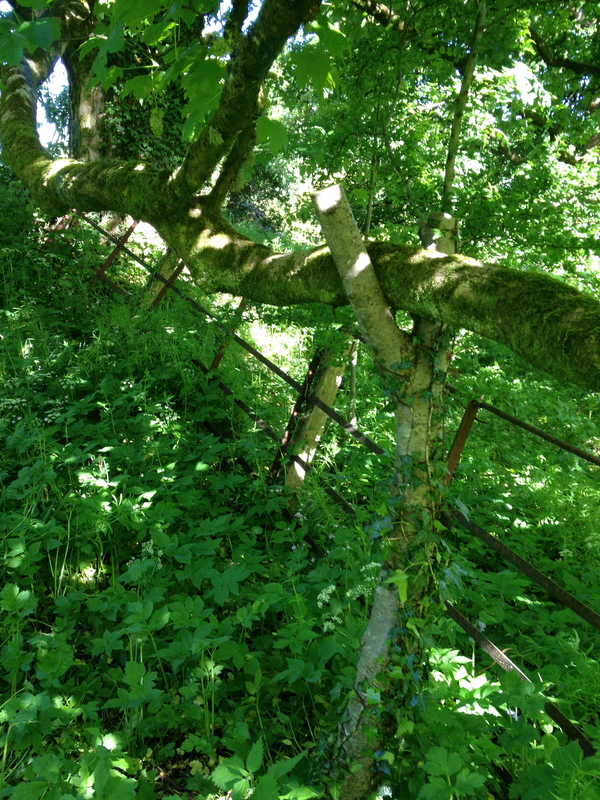 One of the old sycamore trees by the paddock has a long, low-hanging, gnarly branch running along a stretch of the paddock fence for about 20 feet – and it’s in danger of breaking off under it’s own weight. Ed’s said for some time that it needs a crutch to support it so this evening the three of us headed over to a hazel tree by the burn. The branch still needs protecting where it’s sitting in the y – to prevent the bark rubbing off when the wind blows. A bit of old carpet from the kitchen is earmarked to do the job. Categories: acres, castle, country house, countryside, gardens, moving, scotland | Tags: bill hook, sycamore | Permalink.